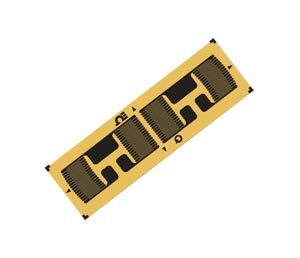 The linear pattern strain gauges are used to measure strain in a single direction. The strain gauge pattern is shown on the left side of the table. Notice the "arrow" which indicates the principal stress direction. The linear pattern strain gauges are available in a variety of styles and sizes. OMEGADYNE® offers miniature linear patterns for strain measurement of a stress concentration or high gradient areas. The terminations are offered both at one end of the grid, or with one at each end of the grid. Wide or narrow linear grid patterns are available. To determine if the strain gages have ribbon leads or solder pads, see the column labeled "TERM" short for termination, "L" indicates ribbon leads, and "SP" indicates solder pads. To determine if the strain gauges have temperature characteristics matched to steel or aluminium, see the column labeled "COMP" short for compensation, "ST" indicates steel, "AL" indicates aluminium. See the column labeled "BTP" for accessory bondable terminal pad model numbers. Dimensions are listed for pattern gauge grid length (A) and width (B), and the matrix or carrier length (C) and width (D). The patterns include alignment triangles and letter codes indicating creep code.